The official name for readers' favorite mural is Waste to Energy Facility 25th Anniversary Mural. Urban hubs across the Inland Northwest have seen an explosion of new public art projects in recent years. Whether by car, bus, bike or on foot, a trek through town is not made without sighting at least a few massive murals on buildings and walls, the colorful signal box wraps at street corners and other beautifying pieces. One of these public art pieces is seen by thousands of commuters each day, making it a well known favorite of many. The all-seeing "eyes" along a west-facing retaining wall where Maple and Ash meet on the north side of the Maple Street Bridge was installed back in July 2016 as part of a joint effort by the city of Spokane, Spokane Waste to Energy Facility and Spokane Arts. Designed by brother artists Todd and Cain Benson — known for several other eye-catching works in the area, including a mural on the Spokane Arena's ceiling and portraits at the Maple and Second underpass — the massive artwork commemorates the 25th anniversary of Spokane's Waste to Energy facility. As such, it's titled "Waste to Energy Facility 25th Anniversary Mural, but if you prefer the simpler name "Eyes on Maple," that's OK, and most Inlander readers do. Stretching across the concrete wall are four pairs (and three more individual eyeballs on faces depicted in side profile) of enormous vividly hued eyes — green, amber, violet, cerulean and hazel — peering out from their gray-toned visages at all the traffic whizzing by. Artist Todd Benson says the emotionally expressive design was directly inspired by the residents of Spokane. "The eyes represent the people and our consciousness as a community," Benson says. "How we dispose of waste and how we look at energy is a conscious manifestation of how we manage ourselves. The color in the eyes represent that awareness." The Benson brothers' mural was installed by a team of six professional local artists, with help from dozens of volunteers. The bulk of painting took place at night due to Maple's high volume. Around 100 gallons of paint were needed to complete the piece on a very tight seven-day turnaround, Benson recalls. "Cain and I were both very surprised and very thankful for this honor," Benson reflects. "We have to share this with all those who helped us: Spokane volunteers, the city of Spokane, the Waste to Energy Facility and Spokane Arts." Next up, the duo is looking forward to starting work on another public art project — a mural in Coeur d'Alene. "Art is the soul of the city," Benson notes. 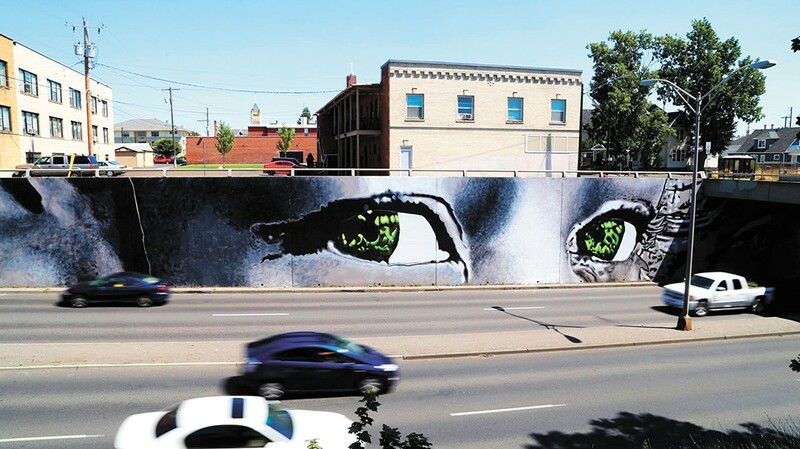 The original print version of this article was headlined "Best Mural: 'EYES ON MAPLE'"